Rtakhrab Pai’ dpung (lit. 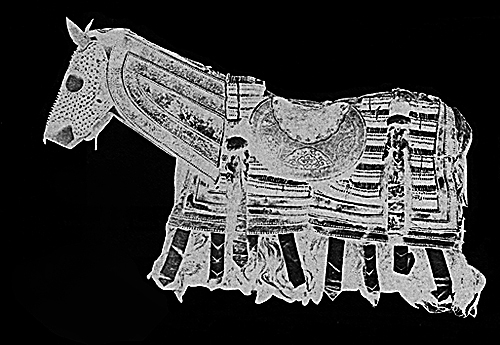 “Armoured Horse Cavalry”) represent warriors drawn from the Sger Pa class. 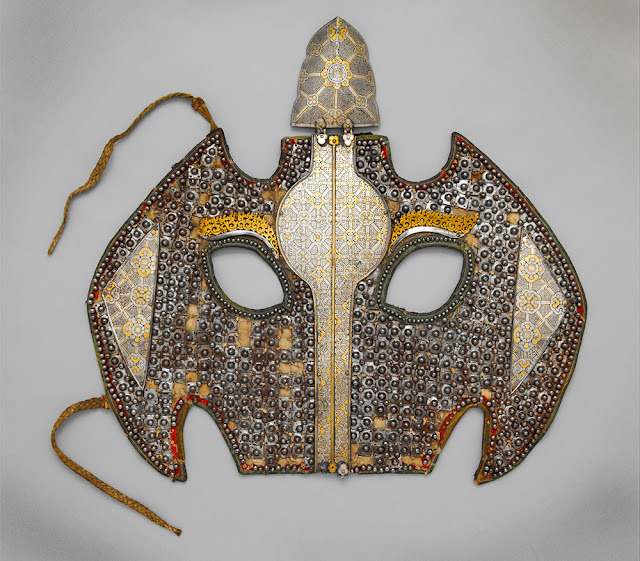 These nobles can afford to dress go chan gyon pa, or in the rare full body armour with steel helmets (rmog), as well as providing their chargers with the finest horse armour (rta khrab). 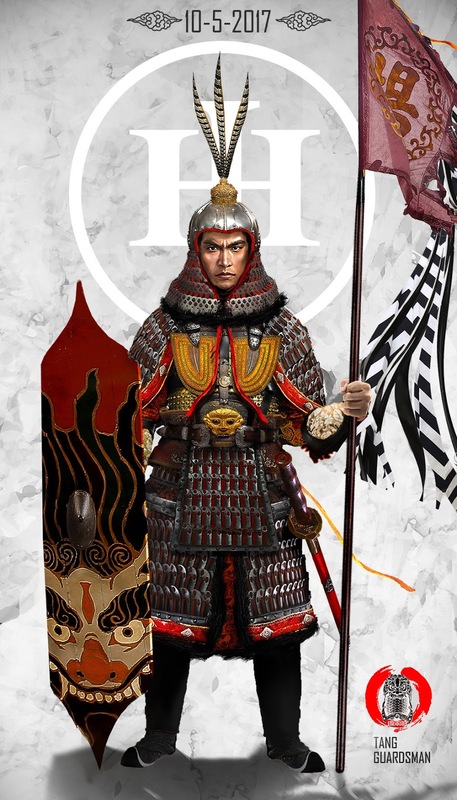 Carrying long spears (mdung) a bow, and distinctive shields with an iron boss (sba phub) these warriors wear either lamellar armour or chainmail plates. 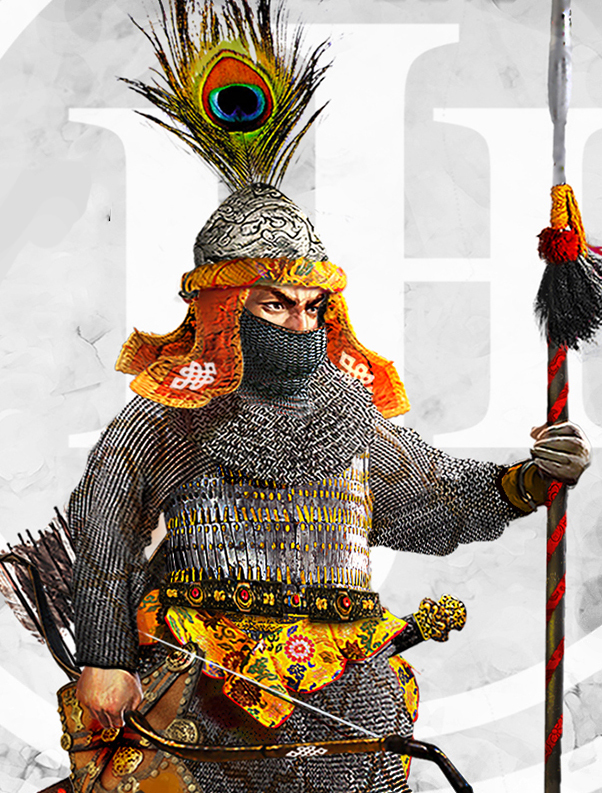 In Buddhist art, peacock feathers are worn by certain warrior-deities (dharmapalas) as part of their helmet adornments and thus signify the elite status of these troops. The men and horses all wear chain mail armor. Its workmanship is extremely fine. It envelops them completely, leaving openings only for the two eyes. Thus, strong bows and sharp swords cannot injure them. Their archery is weak but their armor is strong. 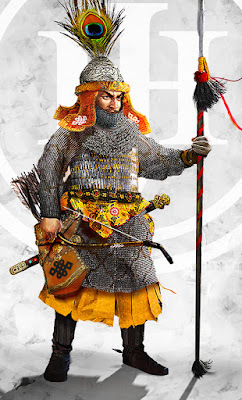 Though the Tibetan Empire and Tang Dynasty of China began as cautious friends and occasional adversaries, during the 8th and 9th century, the two polities became mortal rivals over the control of the Tarim Basin and all the lands east of the Gansu Corridor, sensing Tang weakness in the aftermath of the devastating An Lushan Rebellion where nearly 13~ 36 million of its subjects died, the resurgent Tibetan Empire under the able rule of their God- Emperor (Chosgyal) Trisong Detsen, would frequently launch deep and organized raids across the western frontiers of the Tang. 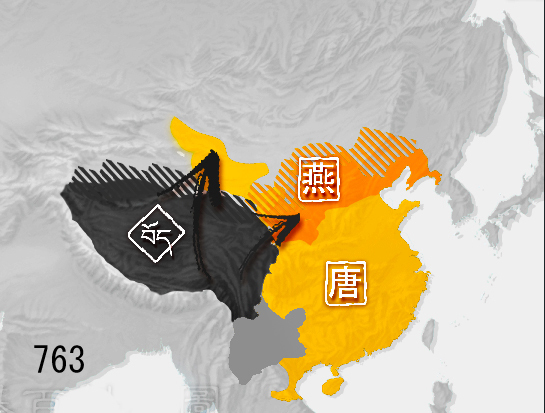 (Tibetan Empire in black, Tang in gold, and An Lushan's forces "Yan" in orange) The Massive An Lushan Rebellion effectively severed Tang China in half, leaving only a renegade court and several loyalist provinces that resisted the rebels. During this time, the Tang Tarim Basin (left- yellow) holdings, called the Anxi Protectorate was completely stranded and lost all connection to the heartland of China because its only access to interior- the thin Ganxu Corridor was completely bottled up by the rebels. Seeing an opportunity to take all of the Tarim Basins, the Tibetans launched several invasions to take hold of the stranded province. A Tang and Tibetan guard of the 8th century. Over hundreds of battles were fought and the Tang lost both its western holds in the Tarim Basin as well as most of its western territories. At one time, the imperial capital of Chang An was taken by the Tibetans. 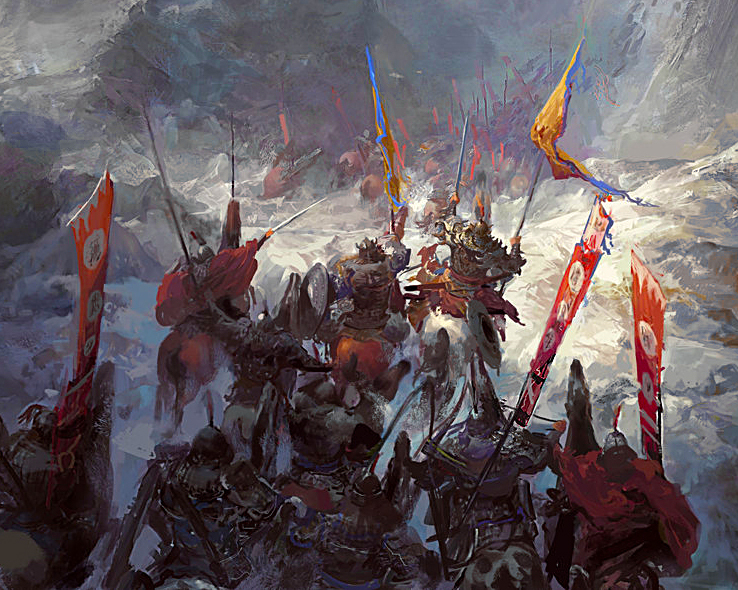 However the fortune of the conflict would turn when the able Tang general Gou Ziyi 郭子仪 who quelled the An Lushan rebellion returned to the front and drove the Tibetan back beyond all of the Tang boarders. Despite these developments, the seesaw action between the two states did not stop. After this initial frenzied bouts of battles, the Tibetan Empire and the Tang would continue to wage war for the full century- while the Tang kept loosing and the Tibetan Empire continued to expand until it reached to its territorial zenith in 790, By the reign of the emperor Ralpacan, in the opening years of the 9th century, it controlled territories extending from the Tarim basin to the Himalayas and Bengal, and from the Pamirs to what is now Chinese provinces of Gansu and Yunnan. 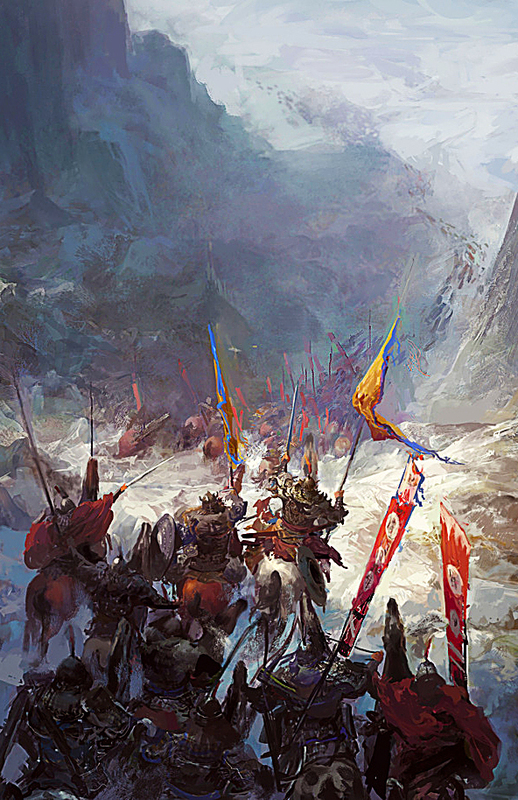 At once, the Tibetan Empire boasted thousands of well armored warriors all encased in heavy armor and rattan shields and had many vassals. Its power was such that the Abbasid Caliphate as its height feared it. The fruits of their conquest would also be their downfall. For because they have risen so suddenly, and so successfully extended across so many domains, nearly all of their neighbors began to fear them- as one. The Tang and the Abbasid Caliphate were initially slow- to trust neighbors due to their first contact battle at the Talas River half a century earlier. But because of the unchecked strings of Tibetan expansions- until all the lands that lay between the Tang and the Abbasids all belonged to Tibet. The Abbasids, under their great Caliph Harun Al- Rashid struck an alliance with the Tang to check the Tibetan expansion. The webs of diplomacy would eventually be the undoing of the Tibetan Empire. Soon- the Uyghur Khaganate- allies of the Tang would also deal blows against Tibetan holds in the west. However his reign was cut short. 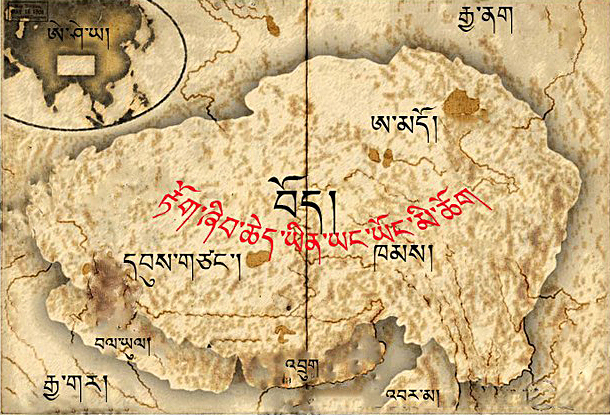 With the death of Rapalcan and Langdarma, the Tibetan Empire would for centuries hence be shattered into hundreds of fiefs and fortified monasteries in an age called "The Era of Fragmentation." And with the death of the Tibetan Empire and Tang Dynasty China, both people looked toward different destinies. Tibet would remain fragmented for centuries to come while the Han Chinese would fragment into many warlordoms for nearly a century and then unite under a scholarly Song dynasty, of course by that time, the two people began their relations anew and engage in the trade of tea and horses. When the Song was threatened by steppe barbarian hordes from the north, the various Tibetans would sent aids of war horses while the Chinese traded them with gold and tea. The two people were both united for the first time under one government under the yoke of Kublai Khan's Mongol Yuan dynasty. 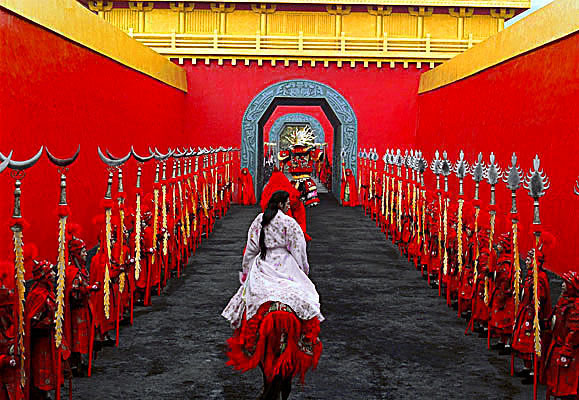 Many nomadic elements of Tibet are born, live and die on horseback. These nomads dwell primarily in the two eastern areas of Amdo and Kham where the authority of the monasteries are weak, and many still live in relative isolation from other tribes. 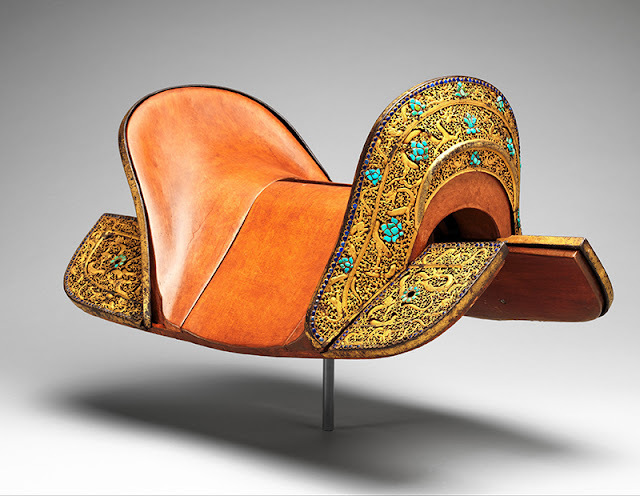 An extremely ornate saddle of a feudal lord, only the most elite elements of the Tibetan feudal nobles were able to afford this- most of the horsemen wore multicolored wollen saddles. 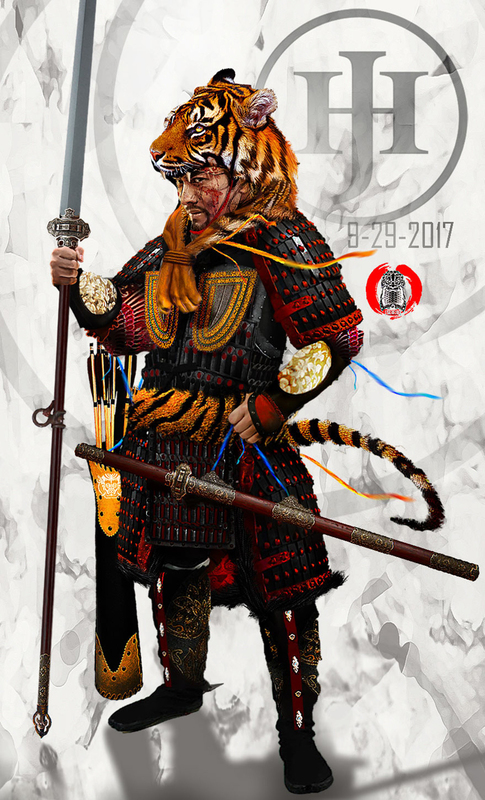 In the days of the Yarlung kings and the Tibetan Empire, the core of the Imperial army would consist of warriors such as these. However, during the two centuries of power vacuum in the Tibetan plateau known as the Era of Fragmentation means few local rulers can afford to maintain a large armoured cavalry. These men act as elite bodyguards for local warlords and Gompa administrators (geluns). In the aftermath of the fall of the Tibetan Empire many survived through trade with neighboring Chinese polities and raids against rival warlords. The Tibetan Empire's officers were not employed full time and were only called upon on an ad hoc basis. These warriors were designated by a golden arrow seven inches long which signified their office. The officers gathered once a year to swear an oath of fealty. They assembled every three years to partake in a sacrificial feast. Despite their prowess on the battlefield, supply and provision for the Tibetan armies have always been lacking and highly disorganized. Compared to the neighboring Mongolian and Chinese polities, the Tibetan lines of supplies were very strained. 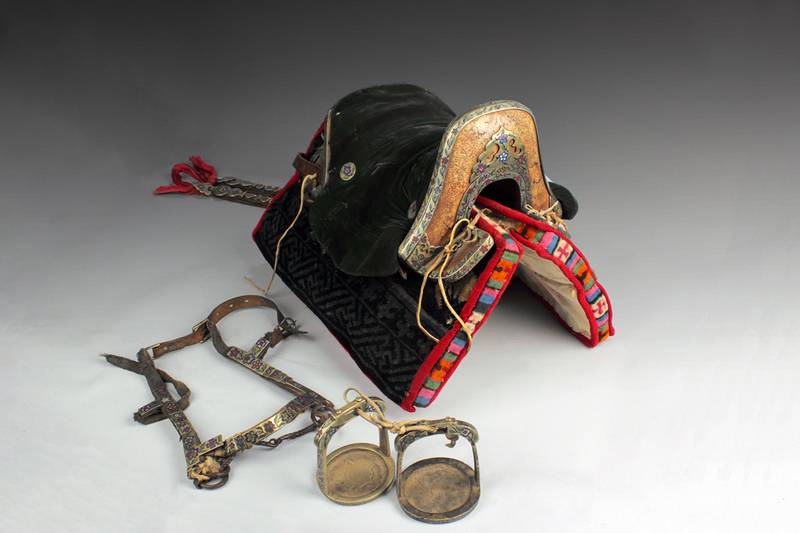 While on campaign, Tibetan armies carried no provision of grain and lived on loot and plunder. 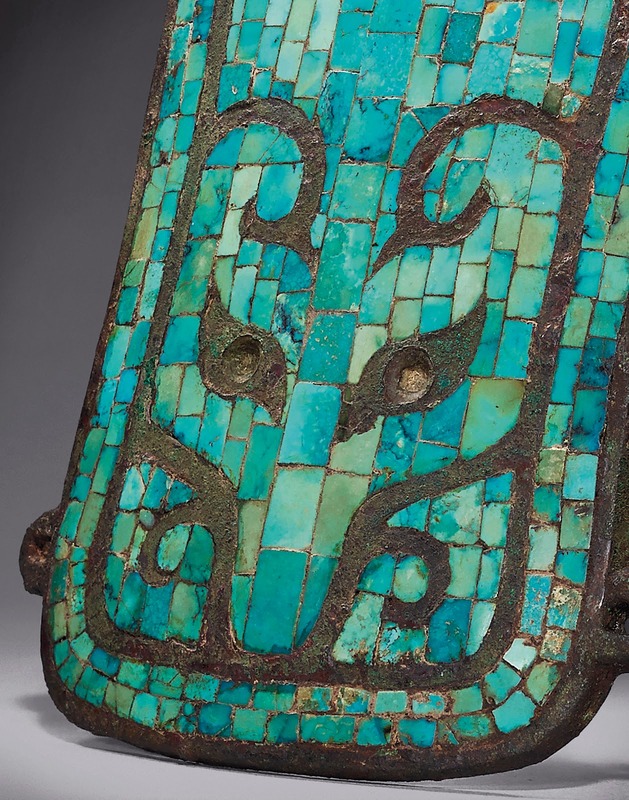 How historical is the use of the 'Endless Knot' emblem on the bow holster? 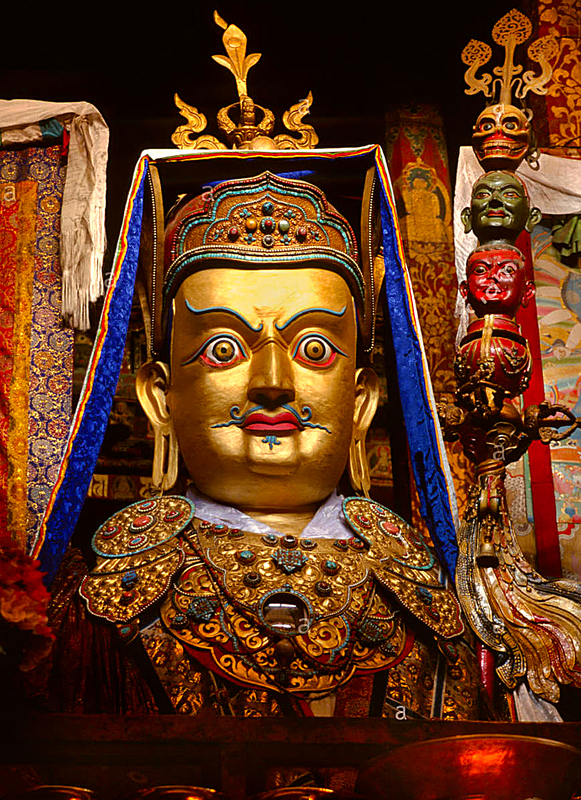 Why is the Tibetan leader called "Emperor" and not King? Was there a Tibetan equivalent of the title 'Khan' used by the nomadic peoples? The endless knot, or in Tibetan as དཔལ་བེའུ། dpal be'u; has been used as one of the Eight Auspicious Symbols of Tibet~ its a very ancient symbol and appeared on clay tablets from the Indus Valley Civilization (2500 BC), and represents the eternal continuum of mind and infinite wisdom. In this case its notable because the first true Emperor of Tibet who united all of the tribes of the Tibetan Plateau- Songtsen Gampo was a Buddhist supremacist and put down the old Shamanistic Bon sorcerors and their followers. In this case the knot represents not only of his regime's core beliefs but also serve to illustrate the infinite truth of him seeing the correct ways of Buddhism. I actually based this on a quiver that has an infinite knot design on it, but it was twice as elaborate. 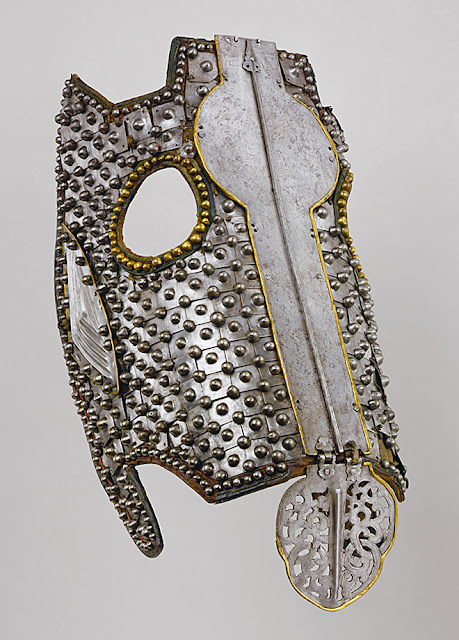 Though I cannot guarantee it was used on quivers as far back as the days of the Tibetan Empire, it was used frequently in the artworks of the era. 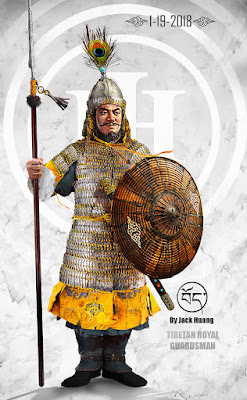 If we are talking about the word "Emperor"~ Well, the line of Tibetan rulers before they united the many tribes of the Tibetan plateau were called Kings. Before the unification of Tibet there were many chiefs (or Kings) and the most noticeable ones among them was the line of kings in the Yarlung Valley (Yarlung Kings.) The Tibetan plateau was, at this time, a mosaic of clans of mountain shepherds with simple nomadic organizations. Each clan had several chiefs. 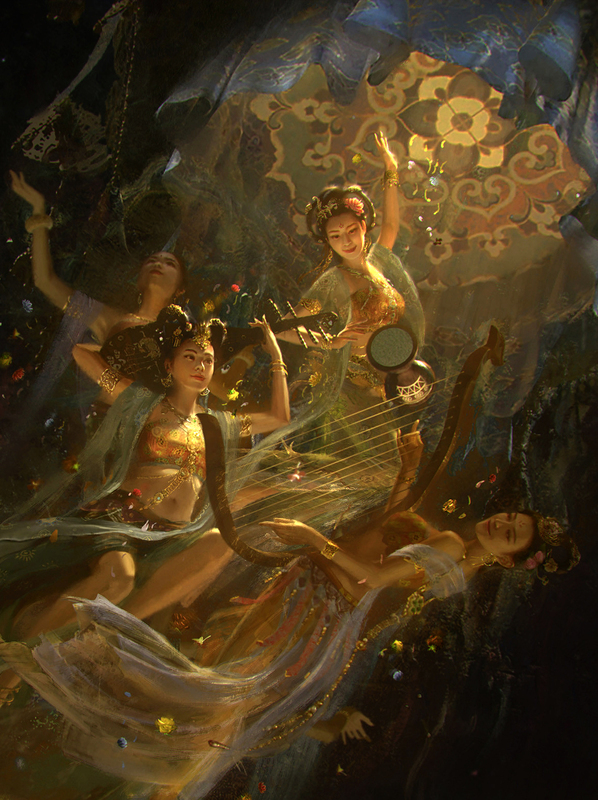 These clans had few material and cultural exchanges according to topography, climate, and distances, which means that each clan, located in a specified network of valleys, had its own culture with little in common with other clans. Traditional Tibetan titles for the emperor include tsenpo ("Emperor") and lhase ("Divine Son"). 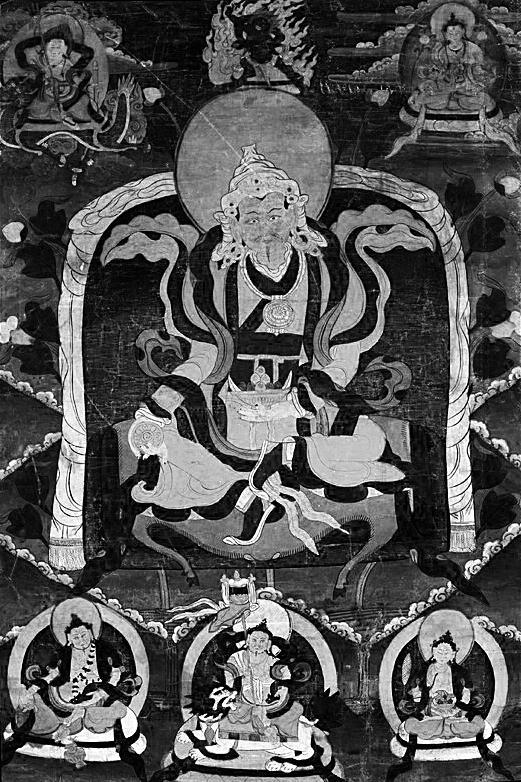 Songtsen Gampo's father Namri Songtsen (?–629) was instrumental in laying the foundation for Tibetan unification. Around 600, Namri Songtsen become the uncontested leader of the several Yarlung clans. Using shepherd-warriors he subdued the neighboring tribes one after another. Expanding his rule to all of modern Central Tibet, including the Lhasa region allowed him to rule over many groups, and to begin the establishment of a centralized and strong state, with skilled troops who gained experience in their many battles in the early 7th century. This formed an important base for the later conquests by his son, which unified the whole of the Tibetan plateau. Thus the title Emperor could be considered their word for supreme King, not only that but Namri and Songtsen both streamlined the bureaucracy so its very centralized, in name he may be considered the first amongst equals compared to local chiefs but his power was supreme. The Title Emperor also has multiethnic implications, which the Tibetan Empire certainly was- often they warred and accepted vassalage of the neighboring peoples, from the Monpas to the Nepalese, the Assamese, the natives of the Tarim Basin to the Proto-Burmese. So they were Emperors over an Empire. I read somewhere that Tibetan cavalry did not usually, or very rarely, "charged" into battle or attack from horseback from gallop, and where primarily used for mobility for dismounted infantry. However most representations/paintings I see of their cavalry in action seems to show this, and on top of that they equipped their steeds with thick armor such as the chaffrons listed in this post, which I would reckon would only be useful for attacking on horseback. 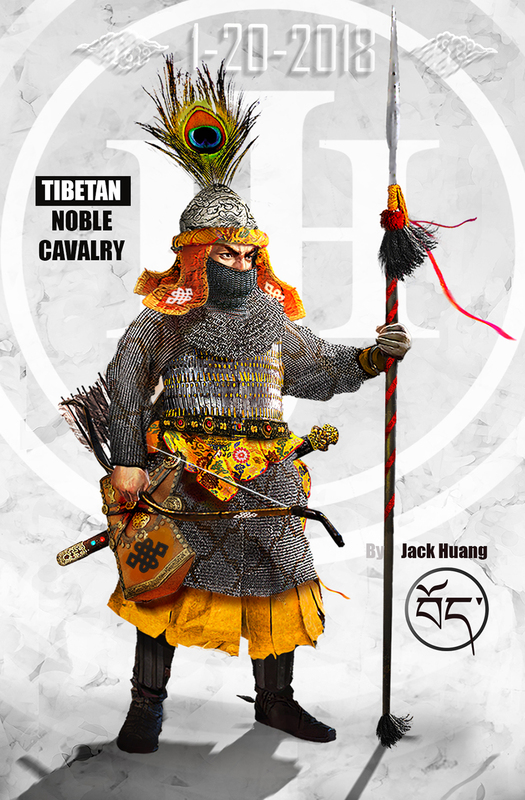 Do you know any specific examples of a Tibetan cavalry charge or is there enough physical evidence to suggest that it was done at some point during the time of it's empire? Well the Tibetan society had a lot of herders and nomads and thus were excellent horsemen. A lot of Tibetans today are still great riders. The contemporaries of the Tibetans described them as fielding powerful cavalry with heavy armor.